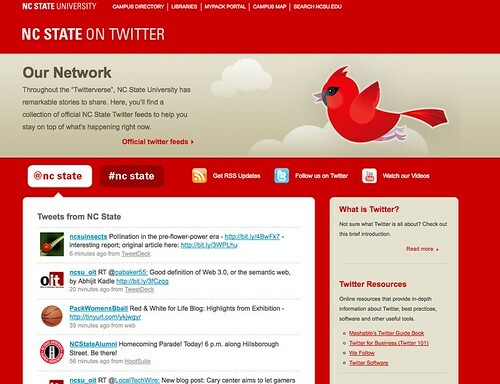 North Carolina State University has really made an impressive case for using Twitter more extensively on campus. A wide range of departments, organizations, and clubs at NCSU are using Twitter to get announcements, events, and relevant links out to the campus community, and they created a slick aggregation space that brings all of this together cleanly. They’ve even made the source code for the application they developed freely available to anyone who wants to use it—-major kudos to the NCSU development team. Now we have been playing around with this idea for a while now, and it seems like we are starting to see a wide range of departments, groups, and affiliated organizations here at UMW are interested in using Twitter for announcements and the like, so—if I can convince Martha—-we are going to hack around in UMW Blogs to try and get our own aggregation point for UMW Tweets that feature news and announcements that are relevant to campus. The site will be http://twitter.umwblogs.org, and as I see it now, we will be using the Add Link widget to have people drop off their Twitter info, and then pull it all into FeedWordPress so that we can both aggregate and publish the various Twitter streams into one site on UMW Blogs. You may be thinking to yourself at this point, why not just use the code NCSU so graciously made available? That actually a good question, and my only response is I know nothing about PHP libraries, and rather than setting up a new instance, I’d rather see if we can’t quickly hack together a similar model using the tools we have, a space a large part of our community already is familiar with and regularly visits. If it doesn’t work out, we can always play with the code and PHP libraries I’ve been trying to avoid. The only issue with the Add Link/FeedWordPress setting is getting the Twitter avatar to appear. I think we can hack the P2 theme to get us most of the way there, but the avatar will be looking for a Gravatar associated with an email, or an Avatar created when a user starts their UMW Blogs account. So what we need to do is make sure anyone who adds their Twitter account to http://twitter.umwblogs.org has a UMW Blogs account. I think we can do this by putting a hacked version of the Add Users/Add Link widget that requires both their UMW email (they will need to be a member of UMW Blogs to add this) as well as their Twitter URL. This will allow us to map the RSS feed in FeedWordPress from their Twitter account onto their UMW Blogs user account. Once this happens, the avatar associated with their account on UMW Blogs (either through Gravatar or the built-in avatar function in BuddyPress) will be associated with their tweets on http://twitter.umwblogs.org, and their tweets will actually link back to their Twitter account. The more I think through this the more I see it may be better to just figure out NCSU’s setup using their source code and go from there, but I guess I’m a glutton for bad hacks. We’ll see, but in the mean time is their anyone out their at UMW interested in experimenting on this with us? If so, add your twitter URL here, and let’s get this party started right. This entry was posted in twitter, UMW Blogs, WordPress, wordpress multi-user and tagged twitter. devwpmued, umwblogs, wpmu, wpmued. Bookmark the permalink. So long as the feed is then jacked directly into the mind of The Bava, I have no doubt this will work. Imagine…greatness in 140 characters or less streaming live 24/7 for the world to witness, along with a cacophony of hundreds of disembodied voices speaking into the air from the depths of UMW Blogs. It’s mesmerizing, I tell you. Very smart. It is amazing to see institutions jumping into the fray like this. A year ago there was nothing but FUD. Nice to see … now, how do we leverage all this acceptance for teaching and learning? Thanks for the welcome, and I still find myself perplexed by Twitter and teaching and learning, but I must say I did hear about a nice use case a week or two ago. A Russian professor at Northern Virginia Community College was using Twitter as a means to communicate with his class inform ally for conversation. Basically twittering in Russian something like I am cooking meatballs, and the students would respond in kind in Russian. I liked this example, but I am still trying to imagine it for more, though I m beginning to think it’s strength remains in the interstices. Oh, it’s all becoming clear to me, Jimmy Groom. You have been trying to dazzle with me with words like “diva” and “a-list” while trying to pull a trick like this behind my back. 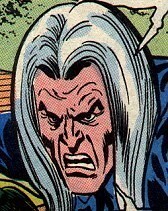 No more, hippie. You have a lot more selling to do. I razzle and dazzle the best of them, and just because you are some”critical thinker” that doesn’t accept the gospel of Groom, does not mean I am done with you yet. I will eventually win this internecine battle, just you watch.